China and Vietnam are, at present (they may soon be joined by Cuba), the only two states which have merged a Leninist political system with a market economy. If it weren’t for the historical animosities, and the situation in the South China Sea, there are hardly more natural allies in the world today than China and Vietnam. Both the Chinese Communist Party (CCP) and the Vietnamese Communist Party (VCP) are run using the principle of democratic centralism, a sort of internal consultation system within the context of a single party state. But there are also key differences between how the two function. And this is where the CCP has lessons to learn in how political reform can be successful, without compromising its power base. The results of the 2006 congress of the VCP sparked debate in advance of the CCP’s 17th Congress, as a year earlier the VCP announced it would introduce competitive intra-party elections to elect the General Secretary. The holder of this office is, as in the CCP, usually regarded as the most powerful figure in the country. The decision was praised by liberal Chinese intellectuals, including the renowned reformist thinker Zhou Ruijin, who published an online journal titled “We Should Pay Attention to Reforms in Vietnam”, while suggesting that the CCP should adopt the same system of election in time for the 2012 Party Congress, in which the once-in-a-decade leadership transition was scheduled to take place. One key difference between the CCP and the VCP is the fact that a sizeable minority of senior figures in the VCP support political reform. 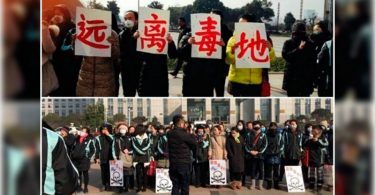 While the reformers are undoubtedly in the minority, there is at least clearly an internal debate over political reform within the VCP, which is more than what can be said of the CCP. After the ‘lost decade’ of Hu Jintao’s rule, despite Xi Jinping’s lack of a reputation as a reformer (in contrast to his liberal Father, Xi Zhongxun), many analysts were optimistic about the hopes of political reform under Xi Jinping. However, since taking power, Xi Jinping has proved himself to be the most authoritarian leader of China since Mao Zedong. Far from advocating political reform, Xi Jinping has overseen retrogression in this area. It is clear Xi is of the opinion that political reform will undermine the CCP’s monopoly on power. A China/Vietnam border crossing. Photo: Wikicommons. Vietnam (and in the past, to a much lesser extent, China) has used the principle of small-scale experimentation to examine the consequences of political reform, as well as other policies such as land reform. In this respect, Vietnam could offer a lesson to China. In 2011, the prosperous (by Vietnamese standards) city of Da Nang, under the stewardship of a charismatic leader, the late Nguyen Ba Thanh, reported that its local party congress had directly elected the Da Nang municipal party leader for the first time. Previously, the leaders were elected via the Party Congress and an Executive Committee. By giving the Party Congress the vote instead of the Executive Committee, the number of electors was expanded from around 50 to 300. Analysts regarded it as an important development in Vietnam’s experimentations with intra-party democracy. As reported in The Economist, dissident Nguyen Quang A announced his intention to stand as a candidate for the National Assembly, Vietnam’s equivalent of China’s rubber stamp parliament, the National People’s Congress (NPC). Though he himself has admitted his chances of success are “nearly zero”, owing to the vetting process all candidates are subjected to, such an act of dissent in China would be unthinkable. Ordinary people can nominate themselves for the National Assembly, but of the hundreds who have done so since 2002, only seven were elected. Still, even this system is more democratic than the one used to elect NPC members. The system of limited self-nomination at least gives dissidents media exposure and a chance to air their grievances. Nguyen Quang A has over 22,000 followers on Facebook which, unlike in China, is not censored. Earlier this year, the result of the VCP’s 12th five-year Congress was seen as a step backward with regards to political reform. Though this may have disappointed Western observers, it should not overshadow the progress the VCP has made in recent decades in promoting political reform. Many analysts regarded the results of the Congress as being a decision by the current leadership to leave the task of continuing political reform to the next generation of leaders: a postponement rather than a suspension. The VCP’s efforts in the field of political reform have undoubtedly been cautious. But for decades, the CCP’s efforts have been non-existent. This must change. Deng Xiaoping once said “without democracy, there would be no socialism or socialist modernisation”. Xi Jinping should heed this advice. Chinese politicians’ natural aversion to risk taking does not bode well for the prospects of political reform. The possible negative consequences of reforming are often focused on, as opposed to the consequences of standing still. However long it may take, stagnation in the area of political reform will one day take its toll on the CCP. Roll on that day. Jack Hazlewood is a student from London, England. He is spokesperson and co-founder of the London-based pressure group Brits For Hong Kong, which supports self-rule in Hong Kong and campaigns for the UK government to honour the promises made to the people of Hong Kong. Follow his group on Facebook and Twitter.